Castle Party Rentals has an assortment of interactive games geared toward teenagers and adults. We call the following interactive games, because many times participants are given the opportunity to compete against others. These inflatable games create really friendly environment, so regardless of the turn out, everyone is always enjoying themselves. Some of our interactive games are small, while others are very large, but you are sure to find one that satisfies your budget and liking. For advice on what interactive game or inflatable game to rent, feel free to call one of our event planners for assistence. Castle Party Rentals has just added a new miniture golf course to exciting line of interactive games. Each hole measures a 4' wide and 8' in length. This is the biggest portable miniture golf course that you can rent in Illinois. We will have pictures soon as this is a brand new attraction. If you have any questions about our new miniture golf course rentals, please feel free to give us a call at (630)-400-6545. This new inflatable game is sure to keep the kids entertained for hours. This huge dart board serves as a target. Participants get velcro-like golf balls, which they try to hit as close as they can to the center. Just like a real game of darts, the Bulls Eye Inflatable Golf Game allows you to keep score and determine a winner. This is a great interactive game for all. This is a great interactive game for all ability levels. The game is basketball themed. There are two hoops and opponents must try to score the most hoops before time is called. The hoops are a little lower than regulation so the younger kids can participate and utilize slightly smaller balls for the same reason. Pony hops are the latest additional to the Castle Party Rentals family. If you are looking for a western themed party, but then these are a great choice. They are fun for both children and adults and have been used at many different types of events from birthday parties to corporate functions. Most importantly they are potty-trained and do not have your typical horse manure smell! Looking to promote your event? Then the money machine is a great option. This particular cash cube rental allows two participants to stick their hand into the cube and see who can with the most money, coupons, or whatever else you choose to put into the money machine. This game is not only fun to play, but it's also very entertaining. Make sure to have a money machine at your next special event! Much like the very popular children's game, Inflatable twister comes with a largespinning wheel. This game is designed for children and adults alike. Great game for a corporate party, youth event or children's party. The inflatable twister game has the capability of incorporating many people into a single action-packed interactive game. Bring the thrill of inflatable boxing ring to any event with our realistic inflatable boxing ring. Sparing contestants enter the inflatable ring wearing oversized, foam-filled boxing gloves and protective head gear. The first boxer to knock down his opponent wins. This inflatable game is hilarious to watch and just as much fun for spectators as it is for participants. How fast can you throw a baseball? Using a radar gun, see the speed in real time with each throw on our large digital display. Kids and adults will love the opportunity to use the radar gun on this inflatable carnival game rental. Although the speed pitch is baseball themed, one can measure their soccer kicking skills, their football throwing skills, etc. This very attractive piece includes the inflatable speed pitch structure as well as the radar gun. Inflatable Gladiator Jousting is the inflatable version of American Gladiators. Inflatable Gladiator Jousting involves two participants (gladiators) who climb on top of the giant pedestal, wearing protective head gear. The gladiators then swing at each other with oversized, foam-filled jousting poles to try to knock each other off the giant pedestal. The victorious gladiator is the first one to knock their opponent down on the huge air-inflated Inflatable Gladiator Jousting mat. Suit up in a huge foam-filled body and transform into a skilled wrestler. Challenge a similar size wrestler and see who wins. Hilarious laugher will follow. Did you ever imagine what it would be like to be a 400lb. Sumo Wrestler? Well here is your chance, do battle in our padded suits. This attraction is for teenagers and adults. Sumo suit wrestling is probably one of the most popular party rentals. If you have never seen the Velcro Wall in action, then you have truely missed out. This interactive game has been an American favorite for years. Riders are given velcro suits, inwhich they then jump and throw themselves onto the sticky wall. 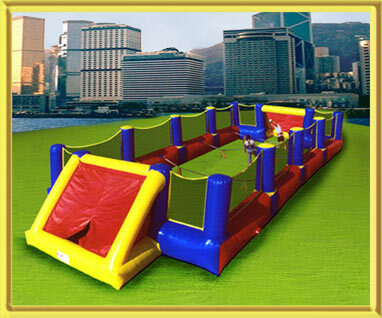 Whether you call it a Velcro Wall or Sticky Wall, this will truely be a great form of entertainment for your guests. The human rollers are the latest attraction in Chicago. They are pretty much giant hampster balls and kids just love them. Participants are enclosed in a safe "bubble-like ball". Peers (or attendants if purchased) push the balls around allowing for the person inside the Zorb Ball to experience free falling sensations. "Bumper Balls" can be played when two have been rented. This attraction does great for Elementary Schools, Middle Schools, and High schools. Please note that this attraction has a 180 pound weight limit. These are also called Human Spheres, Human Rollers, or Hampster Balls. Finally an answer for that customer who wants something different! The Airborne Adventure has an inner capsule where one adult or two children are harnessed into a parachute. A flick of the switch and it's up, and away, rising them almost 20' high for a birds eye view of the entire area! Turn off the switch, and they are gently lowered to earth. Gives 'Hang Time' a whole new meaning! Human Foosball is the life-size version of the popular table game played worldwide. A huge inflatable arena has 10-foot tall netted walls, ensuring continuous play and great spectating. Each player is harnessed to a pole stretching widthwise. Like the toys in the table game, teammates can only move side to side within their specific zones, avoiding physical contact. Teams compete on each side of the field using an official-size Nerf soccer ball to score goals. Human Foosball is very entertaining to participate in and watch. Laser Tag is a great inflatable game rental for all different types of events. This inflatable laser tag arena is really cool on the inside and outside. It will attract crowds from far away. The laser tag package includes the UFO Alien Invasion Maze and the high-high tech laser tag guns. If you are looking for a really neat attraction, then this is what you want to rent. Inflatable rock climbing walls are a safe and flexible attraction for any event. If your event is scheduled to be outside and weather does not cooperate, we can set it up indoors if your ceilings are high enough. if your ceilings are high enough. The surface of the inflatable rock wall is smooth and prevents climbers from getting any abrasions on their legs. Our commitment to safety is our number one priority. This commitment is accomplished with an intelligent and trained staff of professionals, who use the finest grade of equipment available with redundant safety procedures. We use safety precautions and methods that are proven standards to this industry. Castle Party Rentals is the only party rental company in Illinois that offers a portable Go Kart Race Course Rental. This inflatable race course rental is absolutely huge. Huge hit at company picnics! The price includes the huge inflatable race track, 3 fun and fast go karts, 2 attendants, safety gear such as helmets, and much more! If you are looking to make you event very memorable, then this attraction rental is surely for you! Please call Castle Party Rentals for more information.